This weekend the papers were full of gift guides and advice on what to get for the people you love (and your family) for Christmas. Nobody advises you on what not to buy. This I can help with, as I generally prepare an ‘un-list’ of things I don’t want. 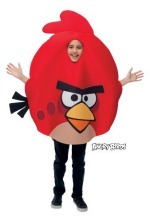 Nothing says Throw me across the room like an Angry Birds costume. This is a trip to A & E and a visit from Social Services just waiting to happen. Look, I appreciate the thought, but I can probably save you the £3.99 and make one of these for myself. Don’t tell the craft bloggers about it, it could spark a craze for a whole new kind of home made Christmas gift. And whilst we’re in the lavatory, let’s pause to admire the game that puts new meaning into the phrase Top Trumps. 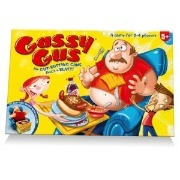 Yes, it’s the farting board game. The family that pumps together stays together – they have to really, no one else will give them house room. 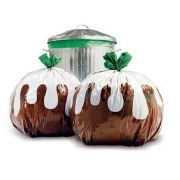 Well OBVIOUSLY it’s important to have your garbage looking appropriate to the season – this is why I shape my bin bags into hearts at Valentine’s, and into the face of the devil at Halloween. 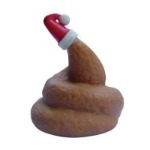 But I think the bin men would rather have the tenner, than the chance to hoick a wannabe plum pudding on their truck. Clearly designed for in-law murdering serial killers who need to dispose of the evidence. Joy to the world! Have you spotted anything less desirable than this lot? What else needs to go on the un-list?